Would you like to honor a loved one in a very special way? Is there a birth or wedding in the family you’d like to memorialize? Perhaps you would love the opportunity to commemorate your years in Lafayette Square? The Square’s Commemorative Brick Program provides a chance to show your support of our historic neighborhood. You may be a lifelong resident, a “newbie”, a business owner, or a visitor to the Victorian neighborhood of Lafayette Square. 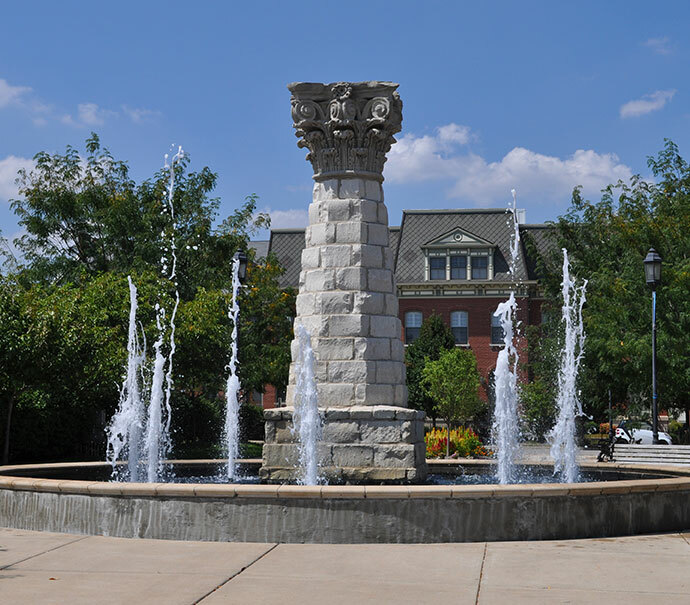 Regardless, you’ve probably enjoyed the beautiful Park Plaza, home to the stately stone fountain. For the last decade, the Park Plaza, located in the heart of the business district, has become a place for celebration and special events. The Fountain Park Plaza commemorative brick patio will be located in the northwest corner of the Plaza, and our brick program is a fundraiser for the ongoing maintenance of that area. The LSRC intends to continue our beautification efforts to ensure the Fountain Park Plaza will be an attractive community asset for generations to come! We’re offering two sizes of bricks: Standard bricks are 4” x 8” with three lines of engraving, for a fee of $100. Large bricks are 8” x 8” with six lines of engraving, for a fee of $200. Orders will be inscribed in batches once a minimum quantity has been met. The first 50 bricks are to be engraved and laid in the Spring of 2015. Bricks may be inscribed with a combination of uppercase and lowercase letters. Your donation is tax deductible to the extent that the law allows. You will be notified of location and dedication of your brick. Click here to order online through our partner Bricks ‘R Us. You will be taken to an online form on their website which will forward all of your information and payment to us. If you have questions or prefer to pay by check, please contact Danny Schuette at danny.schuette1@gmail.com.